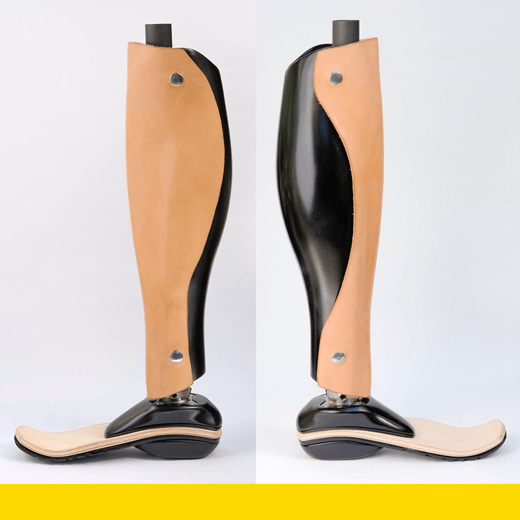 Stance is a low-cost functional, customizable knee prosthesis and lower limb fairing. When an amputee has had a transfemoral amputation (between the knee and hip), they need a prosthesis that replicates the thigh, knee, shin/calf and foot. The Simple Limb Initiative wanted a prosthesis that is affordable and is robust enough for the variable terrain in Colombia. Stance is manufactured using techniques that are easily accessible to the client in Columbia, such as wood bending, casting, fiberglass forming, leather forming, painting wood and leather dying. The foot prosthesis provides the feel of a natural gait through the layered elastomeric materials and the shape of the ankle and heel parts in concert with a foot bed inspired by skateboards. Sandwiching a flexible structural bentwood part between molded parts creates a springy but stable gait that propels the amputee forward while allowing for natural pronation and supination.